Today, March 21, 2013, the United States Mint released clad half-dollar, silver dollar and $5 gold 5-Star Generals Commemorative Coins. Each is available from the U.S. Mint at introductory pricing. Struck in uncirculated and proof qualities, the commemoratives honor five United States Army 5-star generals and celebrate the 132nd anniversary of the founding of the United States Army Command and General Staff College (CGSC). 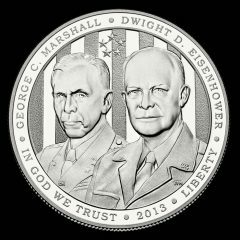 As first discussed last year and described further below, the individuals featured on the commemorative coins include Douglas MacArthur, George C. Marshall, Henry "Hap" Arnold, Dwight D. Eisenhower and Omar N. Bradley. All five were affiliated with the CGSC in some fashion, either as students or as instructors. Prices for the $5 gold coins may vary weekly based on the U.S. Mint’s coin pricing matrix. Initial pricing stands at $485.50 for the proof and $480.50 for the uncirculated. These price points reflect a $5 introductory discount that expires at 5 p.m. (ET) on April 19, 2013. 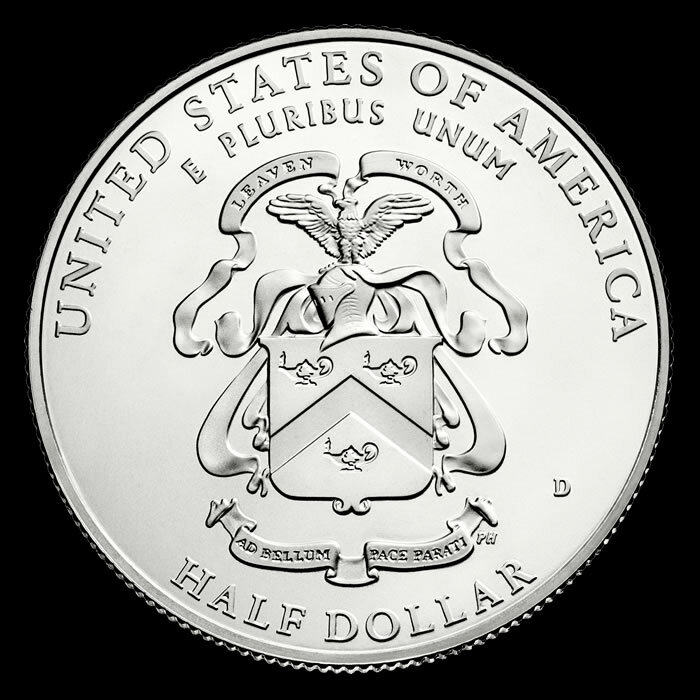 Proof silver dollars are initially $54.95 and uncirculated dollars are $50.95. Like their gold counterparts, this introductory pricing reflects a $5 discount which expires on April 19th. In clad products, the proof half-dollar is $17.95 and the uncirculated is $16.95. After April 19th, their prices increase by $4. Finally, there is the 2013 5-Star Generals Three-Coin Proof Set for $546.50. Its price goes up $5 after April 19. Included within the set are proofs of the $5 gold coin, silver dollar and clad half-dollar. The following table offers specifications for the commemoratives. Up to 100,000 of the $5 gold coins will be issued by the United States Mint. This includes those struck to proof quality at West Point, which bear the ‘W’ mint mark, and the uncirculated coins from Philadelphia with the ‘P’ mint mark. On the obverse of the gold coin is a portrait of General Douglas MacArthur and the 5-star insignia. 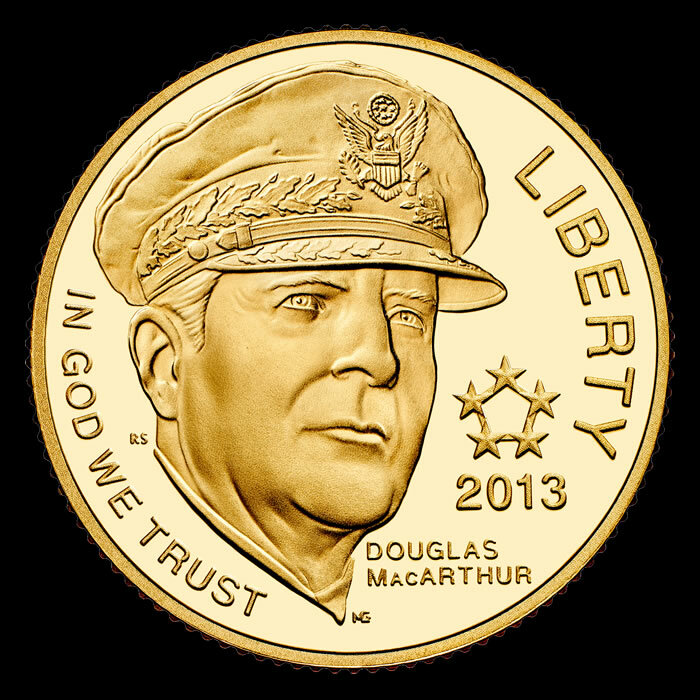 Inscriptions include IN GOD WE TRUST, DOUGLAS MACARTHUR, 2013 and LIBERTY. The design was completed by United States Mint Artistic Infusion Program (AIP) Associate Designer Ronald D. Sanders with United States Mint Sculptor-Engraver Michael Gaudiso executing. 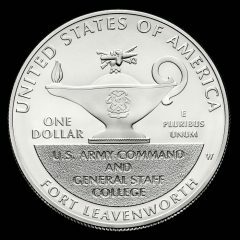 The reverse features a depiction of the Leavenworth Lamp, the symbol of the CGSC. Inscriptions include UNITED STATES OF AMERICA, E PLURIBUS UNUM, FIVE DOLLARS and FORT LEAVENWORTH. AIP Master Designer Barbara Fox designed the reverse image with United States Mint Sculptor-Engraver Joseph Menna in charge of execution. The silver dollars have a maximum mintage of 500,000. The proof silver dollars bear a ‘P’ mint mark and the uncirculated silver dollars have the ‘W’ mint mark. On the obverse are portraits of Generals George C. Marshall and Dwight D. Eisenhower. Inscriptions include GEORGE C. MARSHALL, DWIGHT D. EISENHOWER, IN GOD WE TRUST, 2013 and LIBERTY. AIP Master Designer Richard Masters designed the obverse, and Joseph Menna was in charge of execution. Eisenhower’s image on dollar-denominated coins is not new. Ike’s portrait was featured on Eisenhower dollars from 1971 to 1978 and also on 1990 $1 Eisenhower Centennial Commemorative Coins that celebrated the 100th anniversary of his birth. Sales of the centennial commemoratives topped 1.38 million (1,144,461 for the proof and 241,669 for the uncirculated). 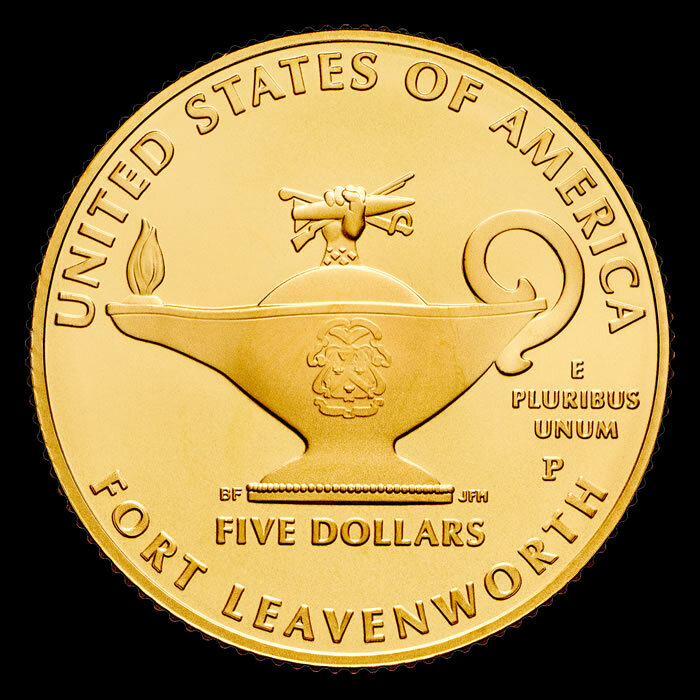 The Leavenworth Lamp with the heraldic crest of Fort Leavenworth is depicted on reverses along with the inscriptions of UNITED STATES OF AMERICA, ONE DOLLAR, E PLURIBUS UNUM, U.S. ARMY COMMAND AND GENERAL STAFF COLLEGE and FORT LEAVENWORTH. Barbara Fox designed the reverse and Joseph Menna was in charge of sculpting it. No more than 750,000 of the half-dollar coins will be released by the United States Mint. The proof coins are struck in San Francisco and carry the ‘S’ mint mark with the uncirculated coins produced in Denver bearing the ‘D’ mint mark. Obverses of the clad half-dollar showcase the portraits of Generals Henry "Hap" Arnold and Omar N. Bradley. Inscriptions include LIBERTY, IN GOD WE TRUST, HENRY "HAP" ARNOLD, OMAR N. BRADLEY and 2013. U.S. Mint Sculptor-Engraver Phebe Hemphill designed and was in charge of execution for the obverse. 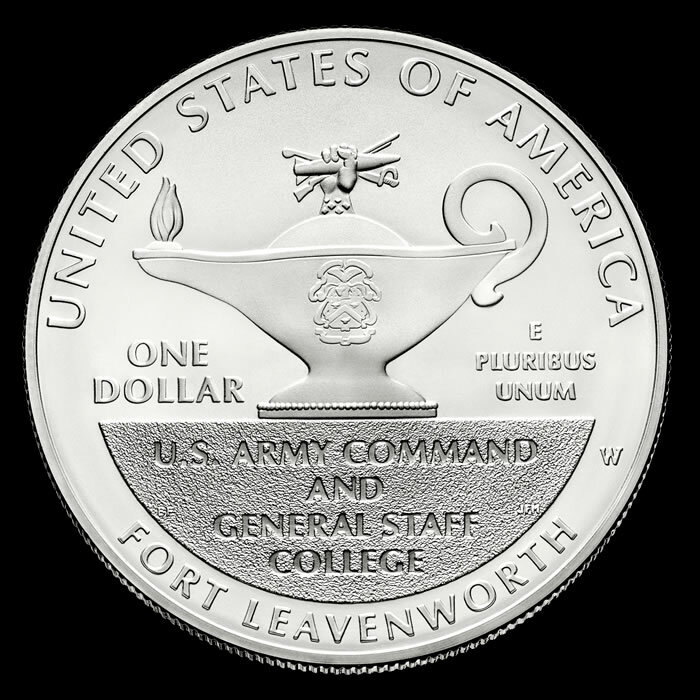 The heraldic crest of Fort Leavenworth is shown on the reverse. Inscriptions are UNITED STATES OF AMERICA, E PLURIBUS UNUM and HALF DOLLAR. Hemphill is also responsible for the design and execution of the reverse. 2013 5-Star Generals Commemorative Coins may be ordered directly from the U.S. Mint either online, right here, or by phone at 1-800-USA-MINT (872-6468). A shipping and handling charge of $4.95 applies per order. 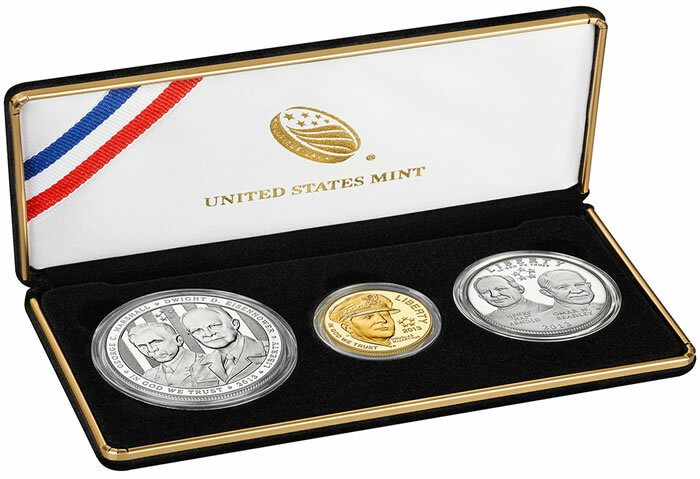 The $5 gold coins and silver dollars are shipped in a U.S. Mint clamshell case. The half-dollar coins appear in a U.S. Mint box. All coins include a U.S. Mint certificate of authenticity. As mandated in the 5-Star Generals Commemorative Coin Act (Public Law 111-262), the commemorative coins may only be sold in calendar year 2013. 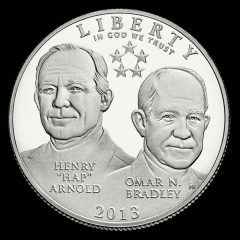 In November, expect the U.S. Mint to publicly announce a sales deadline for the coins of around mid-December. This permits the bureau to follow Public Law 111-262 and still have time to fulfill and deliver coins by year’s end. Surcharges are included in the price of each coin. These surcharges are set at $35 per gold coin, $10 per silver dollar and $5 per half-dollar coin. Amounts raised will go to the United States Army Command and General Staff College Foundation to help finance its activities in support of the college. These are the second and last group of commemorative coins for this year. In February, the U.S. Mint released commemorative Girl Scouts Silver Dollars that celebrate the centennial founding of Girl Scouts of the USA. Struck in proof and uncirculated qualities, the silver dollars are priced the same as the 5-Star Generals silver coins. Into pricing for them expires next Friday, March 29, after 5 p.m. (ET). I just ordered the complete 6 coin set. Wow, $34.90 for two clad halves. One disgusting display of self righteous militarism. We really need to glorify the bankers and industrialists that made it happen. The media that worked so hard to persuade the masses and the politicians that spoke so fervently, hucksters all. The beauty of the eagles are the celebration of liberty, an ideal that glorifies the diminishment of government and the elimination of the police state. These are coins worth buying every time they hit the market. Shawn, it was, is and always will be the person, willing to put on a uniform, train and put his or her life on the line, so that you can spout off about militarism. Warriors ask nothing of you for doing this. They do ask that you be grateful for their sacrifices, and the heavy price many of them pay, to keep you and yours, safe. Of course, only someone who has served would never have to be reminded, of this. I just ordered the UNC 50 cent piece. Looks cool! Thanks to all our active duty & veteran service members! I’d advice Shawn to read up on a little history. While I understand and in many ways share his disdain for the way that politicians (of both parties) have used the military to further their progressive goals and their supporters’ pockets since the 1950’s, to use that same disdain to disparage the contributions of George Marshall, Douglas MacArthur, Dwight Eisenhower, “Hap” Arnold, and Omar Bradley, not to mention the thousands of men and women who sacrifice their lives, is going a bit beyond the pale. Make one thing clear: had the Allies lost the war and the Axis powers won in 1945, neither you nor I would be allowed to type whatever foolishness we wish into an Internet discussion forum without fear of being prosecuted or worse. And if you think these are just theoretical words, ask anyone in Iran or China if they agree. I’m assuming the 6 coin set means gold-silver-clad proof and uncirculated. Shawn – you really should read a few history books. Your rantings aren’t doing you a whole lot of good in this forum. While there may be instances where our military has failed at all levels – generally – they have excelled above and beyond at nearly every turn in every war on every front. Unai, there are two different gold coins, Proof and Uncirculated, two different Silver coins, Pf and Unc and two different Clad coins, Pf and Unc. Six coins, altogether. I guess I was thrown by the word 6 coin “set”. Just got a couple sets for my daughters. My first “some” gold. Unai, good for you! Enjoy your gold coins. You will be astonished at the mint’s expertise in minting these coins. Bud, thank you for your well-reasoned response. WWII was in no way a banker’s war or militaristic bombast; it was for our very survival. One of my cousins (born decades before I was) took a Nazi bullet in his head while leading his platoon towards the French city of St-Lo, not because he was some kind of warmonger but because he was doing his duty for Uncle Sam. My father died prematurely from exposure in the Philippines to malaria and a precursor of Agent Orange. He didn’t ask to go, he went because he had to. If it weren’t for them and millions of others like them, you’re absolutely right. We wouldn’t be here typing away on a free Internet – and what few things we _would_ be allowed to say wurden nicht auf Englisch sein. Odd that McCarthur appears on the $5 gold coin. A 5 Star that was recalled by our President. A 5 Star remembered by historians: ” overlook the arrogance and contempt with which MacArthur deliberately flouted Truman’s directive.”. McCarthur, without permission was ready to start WW3 and disobeyed orders to do so. Yet today, we see him as a hero and place him above more deserving Generals. RBG, if this is your understanding of history, you might want to STAY focused on coins. MacArthur’s defense and liberation of Puerto Rico? I hope you meant the Phillipines. We purchased Alaska (Seward). Puerto Rico we got in the Spanish American war, which we started in a false flag sinking of the USS Maine. We declared war on Britain in 1812, so we could steal Canada, they were well within the rules of war to burn Washington DC. Hawaii was annexed by the US in 1893 through overt pressure on the ruling monarch. Statehood followed in 1959, long after the war had ended in the Pacific. As for Pearl Harbor, the baited trap, to pull us into the war, FDR sacrificed thousands on that gambit (though our more important ships had left the harbor just prior to the attack). Another example of the vaunted American education system. Iraqi didn’t mind invading Kuwait. You know what they did their right. Joe, You realize they didn’t invade the US? Maybe we should invade everyone that gets invaded! Well, provided they have oil or some other useful resource. Maybe we should invade China, they have been involved in cyber espionage and the theft of commercial property. Oh wait, they might actually put up a fight! Chile, Iran, Nicaragua, Libya, what exactly is the threshold Joe? Are you so naive, you think we are the white hat guys? We don’t need to invade China. They’re already here. Democracy allows us to make changes to the things that don’t like. I always like the words of wisdom asking for the strength to change the things I can, accept the things I can’t and the ability to allow another the last word. and the ability to admit I can’t spell. I would love to see more coins that celebrate peace as well, the Peace dollars are quite nice and a reasonable set can be acquired without breaking the bank. No, this is written by a nut case Ken Conklin. The Newlands Joint Resolution of 1897 was the document he is quoting. It is a joint resolution of congress–look it up for yourself if you don’t believe. It is not a treaty. A joint resolution of congress is not a law, not a treaty, has no legal power. You cannot annex the oil fields of Kuwait with a joint resolution of congress. That requires a real, bilateral, treaty. There is not treaty of annexation for Hawai`i. This probably requires much more investigation than I can give this presently, but it is another tragic instance of colonial imperialism. I cannot agree that Conklin is a nut case, however it is clear that the annexation was by joint resolution- not treaty. Still, joint resolutions do have the force of law and in international law, contracts are contracts. The acceptance of benefits establishes a reciprocal relationship that is formally binding. This was a typical colonial coup d’tat, worked all over the world by european and american powers through business influence. A great injustice was done to the Hawaiian people, but this is the raison d’tre of militarism. It looks like I need to buy another book or two, could you make a recommendation? Hey, I’m sorry that I thought we could have selected a better General for the prime coin in this series. I certainly didn’t want to start a political discussion or argument. McCarthur was a good General, his men loved him. But, he was bad a following orders and it cost him his job (temporarily). Ike would have been better, although he is on so many coins already. If I had my way, I’d ignore the 5 Stars and dedicate the series to the best Generals. Then, Patton, another that had trouble with orders, would be in this series. As for the series, I feel the portraits are below average, not the most handsome set of coins. My wife thinks that the demographic for most coin collectors would be white, middle-aged male. Is she right? My apologies to the group for the politics. No more from me. But to Shawn, try “Nation Within” by Tom Coffrman and “Hawaii’s Story by Hawaii’s Queen” by Queen Liliuokalani. There are lots more. To Kevin, it seems to me that most of the collectors i know are getting older. My friend’s kids had never seen a walking liberty half dollar a couple of years ago, had to give them one each so they could experience them. It seems that now days the kids all use their ipods and credit cards to buy stuff so they don’t even use coins, let alone collect them. Thanks for the recommendations. I had already found those two as well as another on the blood percentage issue ( which was common for Blacks and Native Americans as well). If you are involved in the movement, I wish you great success, though you might find there is greater sovereignty as a State then is commonly advertised- another long story. You can start at http://www.state-citizen.org. Kevin, collecting coins and stamps as well, was something I was introduced to in my youth. I’m not sure how much these more traditional activities appeal to our current culture. So, older and white for me. Further, most enthusiasts in my experience are inclusive of all collectors- we love the history, the beauty and the acquisition of knowledge necessary to build good collections. kevin – I might fit that now – but when I started collecting coins 30 to 35 years ago… I’d guess not so. Sad thing is for me – all the coins I wanted then cost too much – almost like today! (difference is I can afford the silver and now drool over the gold and platinum).